Santa will be ditching his sleigh and driving the 1/1A bus around town next week. 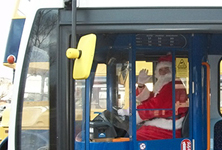 Stagecoach bus driver, Brian Newton (aka Santa) will be collecting money for local charity Epilepsy Lifestyle. Stagecoach has announced a raft of bus services for Boxing Day this year. Buses will run on popular routes across east Kent, some for the first time in over 40 years.